While having all the comforts of home, catch up on your favorite shows! Open kitchen layout for the whole family to stay together while preparing meals. 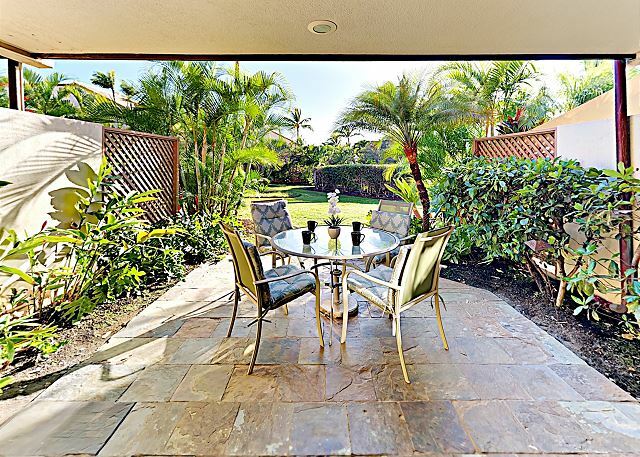 Gorgeous view of the tropical landscaping even from the kitchen! Extra shower makes getting ready as a family ideal! 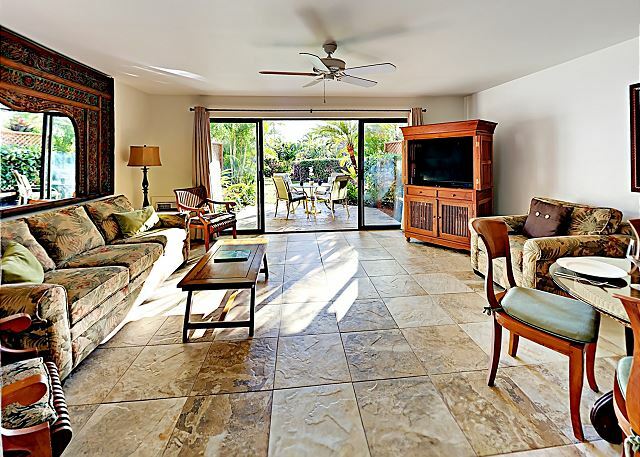 This pristine and spacious condo boasts not one, but two private lanais! One with outdoor patio seating to sip your coffee on and the other nestled beneath beautiful foliage and a rippling fountain. 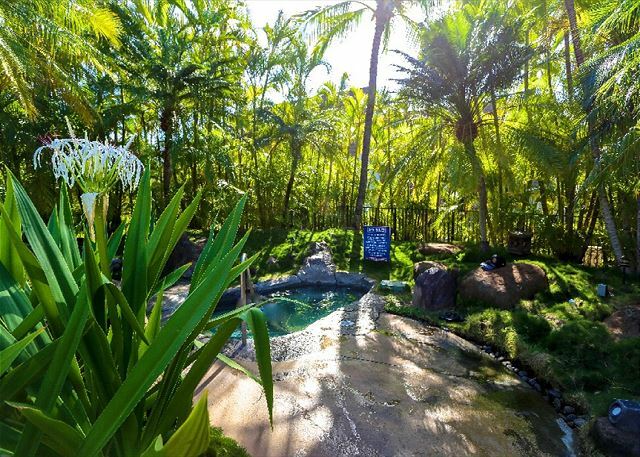 This complex comes equipped with an uncrowded tropical pool with a waterfall, a sand bottom jacuzzi hot tub, in a lush and secluded setting, a brand new BBQ area and a freshly paved tennis court. 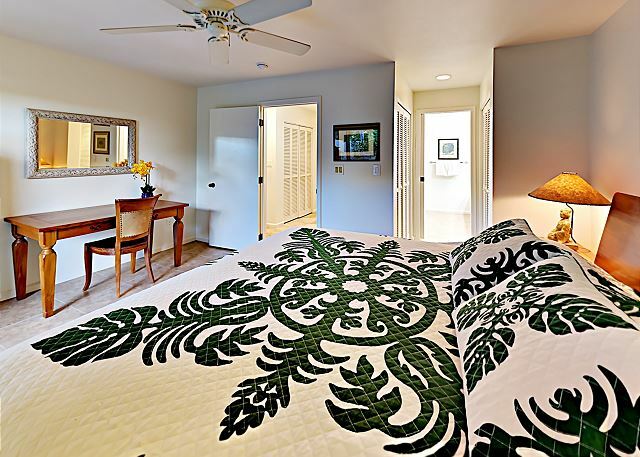 Just across from the white sands of Kamaole Beach, this fabulous unit is perfect for your next vacation. This updated unit is perfect for your next vacation! Tasteful furnishings, unique lush landscaping around the complex and a comfortable bedroom make this condo unique. 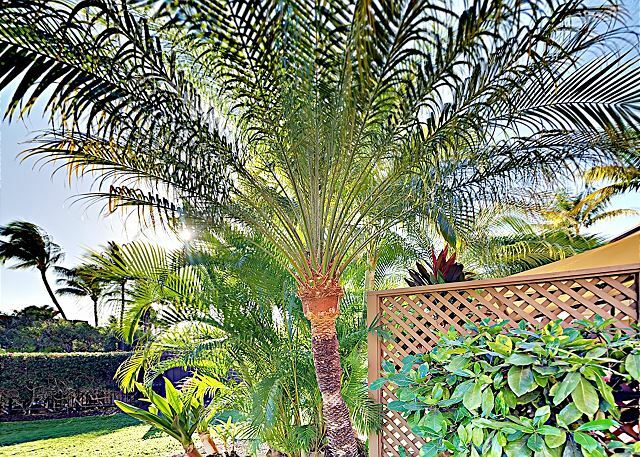 The nicely tiled lanais invite you to enjoy your favorite beverage while taking in the rich, tropical surroundings of the swaying palm trees. The living space is open and bright and features a full kitchen with all the appliances and accessories you could ask for. 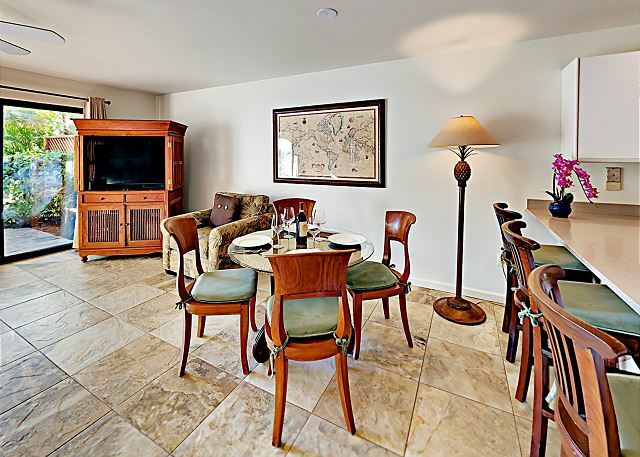 There is bar seating for three and a dining table for four so you can enjoy luxurious meals in the condo. 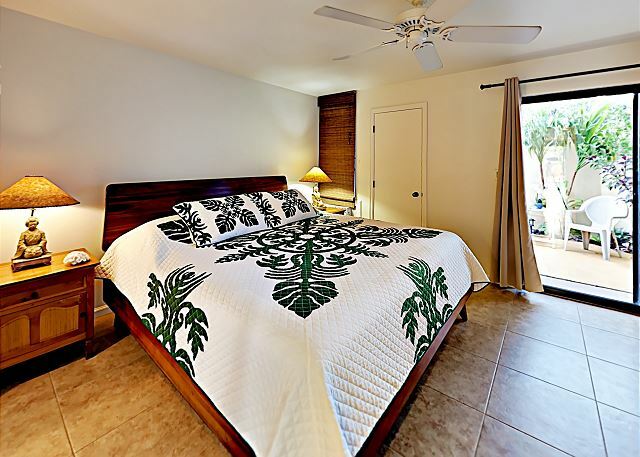 Air conditioning and a ceiling fan in the master bedroom keep you cool while you lay on your king bed and admire the beautiful Hawaiian wood furnishings. Two newly furnished bathrooms make this unit perfect for up to four people as there is also a new pull out sleeper sofa in the living room. PROPERTY AMENITIES: Two Outdoor swimming pools, Outdoor hot tub, Patio pavilion, BBQ grills, Free, self parking, and a tennis court. Maui’s unique and varied terrain offers a multitude of activities. From relaxing on some of the world’s most beautiful white sand beaches to the more adventurous undertakings of zip-lining and paragliding. 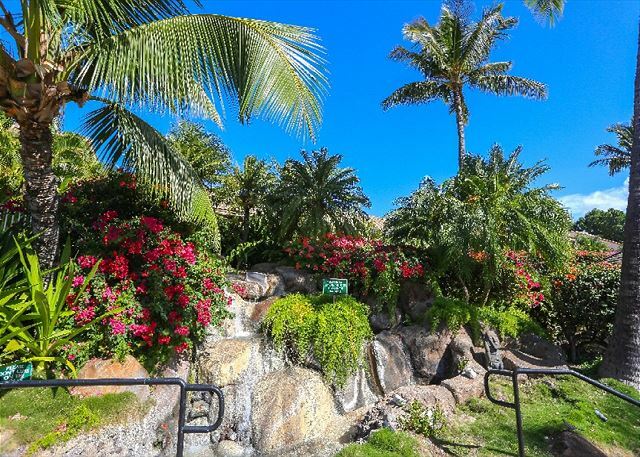 Maui Kamaole's location is such that there are many activities and attractions right at your finger tips. The Kihei Boat Harbor is directly across the street from the complex, so you are mere moments away from watching the whales leap and play in the tranquil waters. Just up the road, you can enjoy strolling through the Shops at Wailea while taking in the majestic views. Some of Maui’s top attractions are: Maalaea Harbor; many boats leave from Maalaea on snorkeling trips, deep sea fishing, scuba diving, whale watching (in season), sunset cruises, and more. It is much faster to leave from Maalaea Harbor than Lahaina Harbor when taking trips to Molokini Crater and Turtle Town. Other attractions include Maui Ocean Center, Haleakala Volcano, Iao Valley, Wailea Golf Club, King Kamehameha Golf Club, Maui Tropical Plantation, and the Whale Sanctuary. The town of Kihei is a quaint, laid-back beach town boasting some of Maui’s most pristine stretches of white sand and turquoise waters. 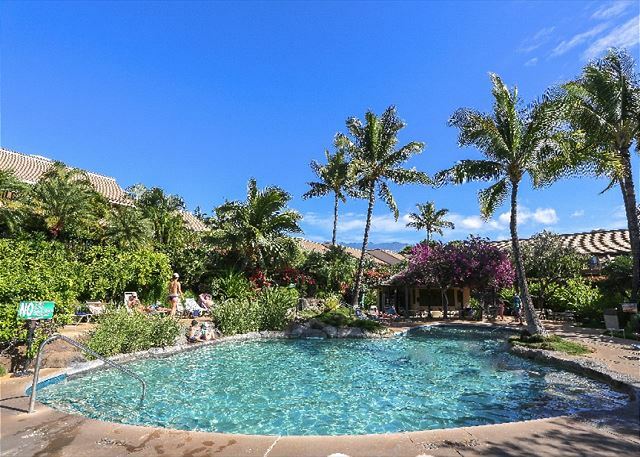 South Maui is fun for couples and families alike.